I think it is fitting to begin this journey with Selena. Selena Quintanilla is one of the most revered artists in the Latino community and has inspired many pop culture icons, including Beyonce. I’ve loved Selena my whole life. She was one of the first artists who inspired me to pursue a creative career. She was young, beautiful, talented, and good-hearted. She was everything I wished to be when I was in elementary school pretending to be a singer named Jessica (yeah, that was a definitely a phase). “Amor Prohibido” translates to “Forbidden Love” in English. This classic Selena song is from her album of the same name that goes on to describe a forbidden love between two people who come from different social classes. A sort of Romeo and Juliet story. Selena sings that despite her poverty, all she gives is worth more than money because what she has is true love. Well, Selena, I don’t have a man but this is exactly how I feel about museums sometimes. I didn’t grow up going to museums. In fact, I don’t really remember when and where my first trip to a museum might’ve been, but somewhere in the 7th grade I discovered Jackson Pollock in a book and didn’t let go. I didn’t know what this love meant but I knew that my life meant nothing without art in it and only museums housed these most precious objects. But museums were beautiful, marble institutions where I was just a visitor. I didn’t even see a real Jackson Pollock until I was a sophomore in college at the National Gallery of Art and I never made the connection between my love of art and a career in the museum field until I was 27 years old. There were just too many detours and road blocks that didn’t allow me to see this path and the barriers to access delayed what could have been an earlier start at a museum career. Once I made that connection, however, the road didn’t get easier or clearer. That is when I realized that the Latino voice in museums was and is desperately missing. I don’t know why I didn’t realize it before. Perhaps I was in a rosy haze of happiness merely being able to learn about art and visit museums (for free!) in D.C. that I hadn’t noticed everything else around me or even what was missing but when I became woke, I BECAME WOKE. In 2014, a diehard Selena fan, Patty Rodriguez, created a Change.org petition calling for MAC to create a Selena makeup line, “…that represents the community that shops MAC makeup.” Almost 40,000 signatures later, MAC heard the message loud and clear. When the collection came out it sold out nationwide, both in stores and online. I woke up early the day it was released and messaged fellow GW museum studies student, Carolyn Lopez, and we coordinated our game plan. We waited hours in the cold outside of Sephora’s Chevy Chase location. When we were finally allowed in, most of the collection was sold out. We ran to the metro, headed to Metro Center Macy’s and before even getting to the makeup counter the ladies yelled they were sold out. Out of breath from running (and out of shape, apparently), we pulled up a list of area stores that would carry it and called every store. Pentagon City Mall said there was a line out the store so they would probably sell out but we took our chances and hopped back on the metro towards Pentagon City. We reached the store, saw no line and I was worried we were too late. We walked in and not only were they not sold out, they had the whole collection many times over. Between the two of us, I am pretty sure we spent about $450. The Latino community deserves to be represented and not underestimated. The MAC x Selena line demonstrated just that. It demonstrated not only the passion of the Latino community but our strength in numbers. I didn’t need another red lipstick and I don’t even use the blush. To me, it was about Selena and what she meant to me. In a world that is white washed, Selena was unapologetically Latina in a way that I could relate. With dark hair and brown skin, I saw myself in her and aspired to be her. I’m sure many of the Latinas waiting in line with me felt the same way. Museums can learn a thing or two about this cosmetics campaign. The Latino community in the U.S. is a force to be reckoned with and although we come from very diverse backgrounds, what unites us is our latinidad, our shared culture and experiences living in the United States. The exhibitions should reflect those experiences, our diverse cultures, and our importance to the shaping of this country in a way that reflects our needs and interests. We are no doubt a growing population seeking to be acknowledged and museums should pay more attention to this demographic that will soon make up the majority of the population. 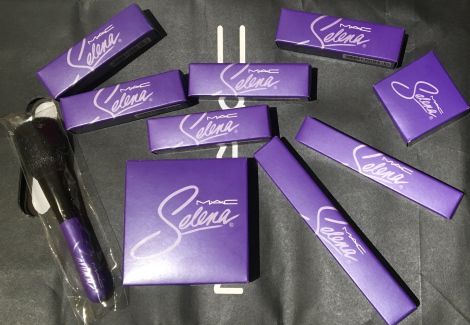 My MAC x Selena collection.